A few days ago, on Saturday the 18th of January, I had the great privilege of playing – for my first time on Broadway – the title role in The Phantom of the Opera. When I first joined the New York company of Phantom, in August of last year, I only had Monsieur Andre on my plate. But a few months ago, our Resident Director Seth Sklar-Heyn and Musical Supervisor David Caddick asked if I would take on the role of understudy to the Phantom. It had been 15 years since I had last stepped onto the stage as the Phantom – in the Toronto production – and as it has always been one of my all-time favourite roles – I didn’t hesitate to say yes. What followed was an incredibly exciting and busy two months of rehearsals, all the while continuing my “day job” as Andre (a treat of a role, if ever there was one) as I prepared the role again. This time, though, it is different: First of all, I’m fifteen years older, and really feel I’m at the perfect age now for the role. Also, my life has changed in so many ways since I first played the role: I’ve lived a lot. Experienced a lot. Been through a lot. I’ve seen a lot of the world – and I’ve had a career at the same time. And I’ve grown (immeasurably, I hope) as an actor. All this makes me sure I can really bring something substantial to the role now, and very, very excited to be able to play it again. The team at the New York production of Phantom is second to none, and so every possible resource is at your disposal. We’ve all worked incredibly hard to make my Phantom distinct. I have to admit that much of my first show was a blur: I was so concentrated on being in the moment that “the moment” is hard, now, to remember! Between having flashes of “I’m playing the Phantom on Broadway… I’m playing the Phantom on Broadway… I’m playing the Phantom on Broadway…” running on a loop through my mind to “…I’m standing alone onstage in front of 1,700 people singing Music of the Night! !” I managed to put a performance across that I was really happy with. It’s a role that demands the utmost of the actor, and one is always going to be drained at the end of it – but opening night adrenaline is hard to describe! Lets just say that it was one of the most unforgettable experiences in my 25 year career. My Phantom debut was the first of what I hope are many opportunities to go in the role – such a thrill to play the man himself, and such an honour to be doing it in the great Broadway production. 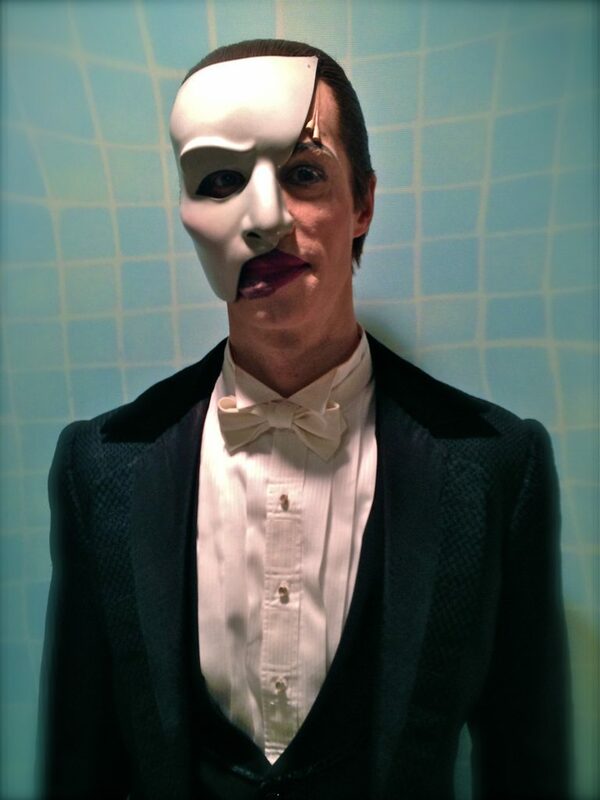 Laird as the Phantom on Broadway. Debut performance. 12 January, 2014.